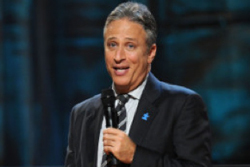 Jon Stewart broke his silence over Rick Sanchez’s comments about him and Sanchez’s firing from CNN. After remaining quiet Friday as Sanchez’s controversial comments from a radio show — in which he called Stewart a “bigot” and suggested that the media is run by Jewish people — became major news, Stewart addressed the issue at Comedy Central’s “Night of Too Many Stars” at New York’s Beacon Theater. According to The Hollywood Reporter, Stewart made at least two references to the situation while hosting the event, which was a fundraiser for autism research. Later in the show, David Letterman made a surprise appearance and joked that he was late because he was “helping Rick Sanchez clean out his office,” according to GossipCop. Sanchez has been a particular target of Stewart’s, which led the Cuban-American CNN anchor to call the “Daily Show” host a “bigot” and complain that Stewart looks at the world with a bias against “anybody who’s different than [he is].” He also complained that Stewart only targeted him to create a sense of fake balance after making fun of Fox News.